One thing you should know about Iceland? The weather can change in a hurry. This post is proof of how drastically it can change depending on where you are and how long you wait! Also, this might be one of my most loved pictures I’ve ever had taken for this site. On our last day in Iceland we were driving through rain on the way to the Blue Lagoon. 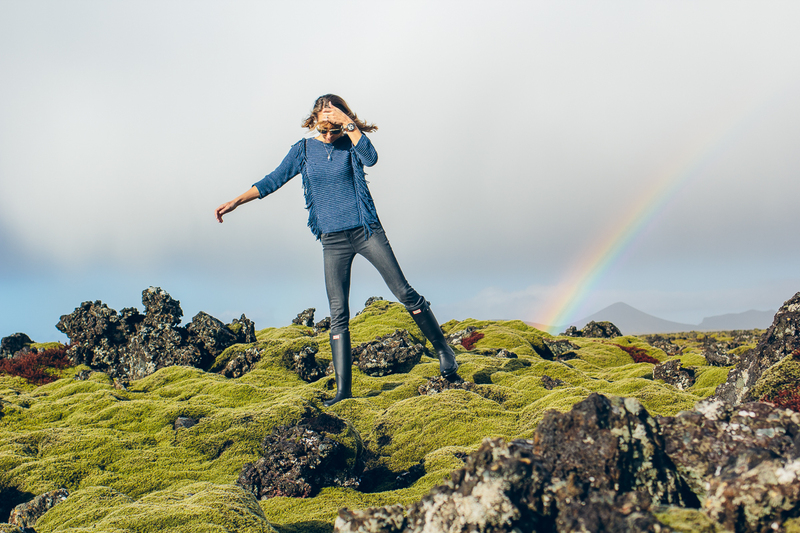 It suddenly cleared up and the most beautiful rainbow appeared, so naturally a bunch of bloggers and Instagrammers begged the driver to pull over so we could shoot some pictures. How lucky was that?! I first saw this sweater when I was in Margaret O’Leary a few months back and I fell in love. The color and weight are perfect for spring and the fringe detail is amazing! 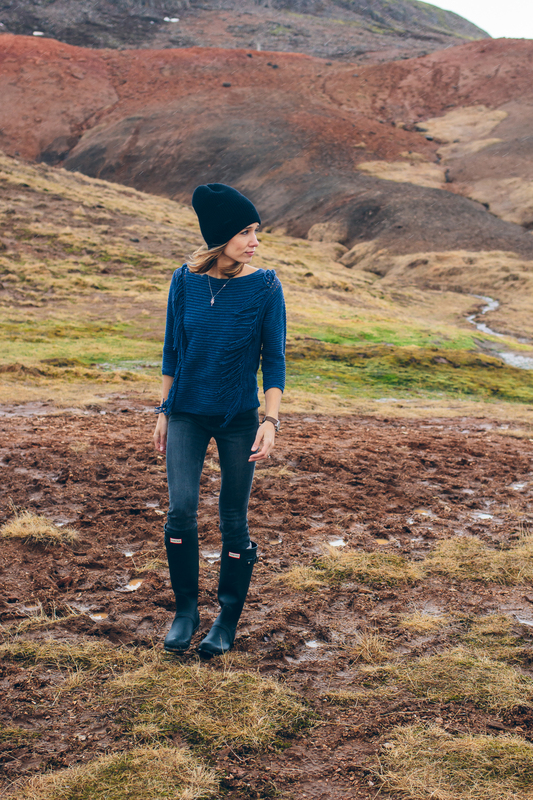 I wore it layered over a camisole in Iceland, but plan on wearing it with white jeans and jean shorts when it warms up. If you’re not familiar with Margaret O’Leary, she’s one of my favorite knitwear designers. Each piece is so unique and made with high-quality materials. They’re more of an investment, but they are so well-made that they end up lasting much longer than my cheap sweaters! The rest of these photos where I’m wearing a hat were taken at Geysir, which was considerably cooler than outside the Blue Lagoon area. As for these rain boots, I can’t believe I didn’t own a pair of Hunter boots before. They were the perfect footwear for the wet climate, but also super comfortable which I didn’t expect. I went with the Original Tall height because I have long legs and I hate when boots hit me mid-calf. The day I got home it was pouring in Chicago and they made Oliver’s walk far more enjoyable because my feet didn’t get soaked. If you don’t have a pair of Hunters yet, you should get a pair! Originally I wanted the green ones and I still love them, but they were sold out. In hindsight, I’m glad I went with the black (thanks for swaying me Kelly!) because they go with everything. If I ever get a second pair it will definitely be green! On the topic of trips, my crazy travel schedule continues today! I’m headed to Dallas this afternoon for the RewardStyle Conference. One of the best parts is that my parents live in Dallas and I get to stay at home and spend some time with them! Kelly and Shaheen are also staying at my house and I’m really looking forward to showing them my hometown! I’ve already warned them, one of our first meals will definitely be Tex-Mex! P.S. The full Iceland travel guide can be found here!